In addition to pheasant hunting, there are plenty of outdoor activities at Elm Lake Lodge. We don’t just limit the activities to pheasant hunting. There are a number of opportunities for the person who loves who loves to hunt or fish. We manage the hunting areas to maximize wild bird production and provide a sporting hunting challenge. We offer wild bird hunting. You can expect ample opportunities to bag a limit of birds. We specialize in pheasants, but we also have good numbers for sharp-tailed grouse hunting, goose hunting and a few partridge. Bird processing and storage is available on site. In addition to our abundant birds we offer a great hunting experience for deer hunters as well. Whether you are hunting deer in North or South Dakota, there are abundant numbers of deer, and some even in the dream trophy class! Fishing is an excellent pastime and enhances any vacation. 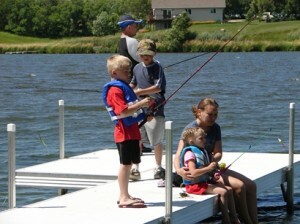 Whether you are ice fishing, shore fishing or boat fishing, you will find Elm Lake accommodates them all. Northern, Walleye, Crappie, Catfish and Bass are the primary species caught in this lake. Even in the winter there is great ice fishing here. There is a large ice fishing tournament hosted by the Elm Valley Men’s Community Club which draws a number of anglers of all ages from across the region. Join the fun and book a stay at the lodge to make a great weekend or more of hunting or fishing, any time of year!